For groups we offer nature tours and activities all year round. We tailor the tours according to the season, time and the size of your group to give you a personal, authentic experience of the nature, culture and history of Koli. And not to forget wellbeing: on our tours you can slow down and connect with the nature. Contact us by mobile +358 4000 231332 or email . 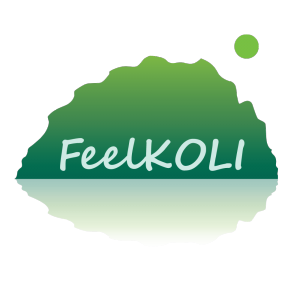 We are here to create a unique experience for you in Koli! 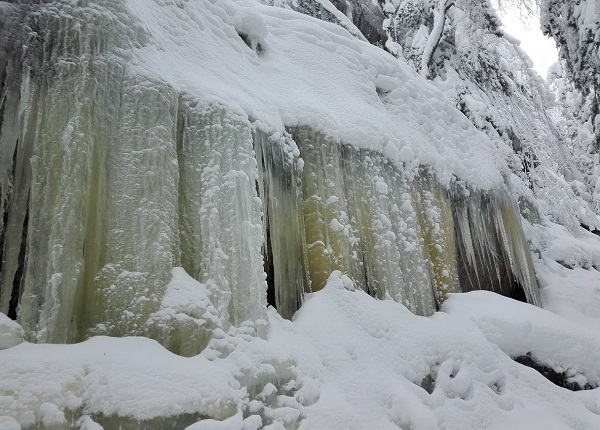 A walking tour to the wintry nature of Koli National Park – safely with snow spikes! The snow spikes, designed for professional use, are easy to use, they fit over our own shoes and give you excellent traction on icy and snowy trails. The walking pace of the tour is relaxed and there is time to enjoy the nature. During the tour your guide, a local expert, tells interesting facts and stories about Koli, its history, nature and culture. Welcome to experience the Koli hills in winter! Difficulty Suitable for people with normal health. The trail has some up- and downhills, but the walking pace is relaxed. Equipment Participants should have warm outdoor clothing and warm winter shoes. Additional information Koli Shop Retkitupa is a small souvenir and outdoor equipment shop located in Koli Nature Centre Ukko. 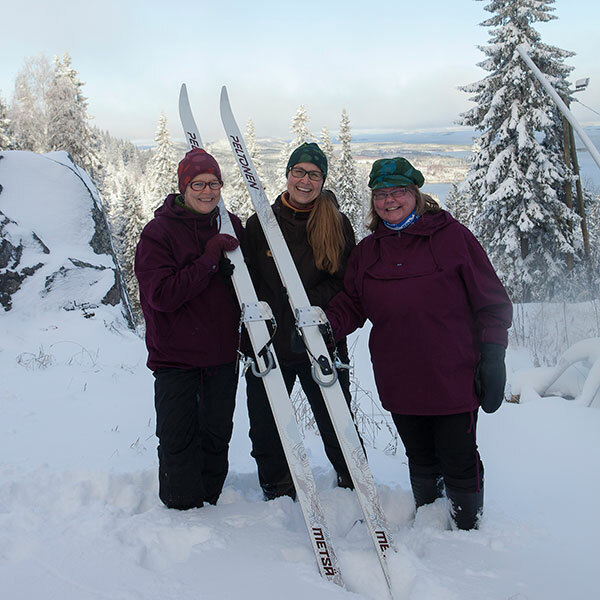 Welcome to explore the hills of Koli with snowshoes! 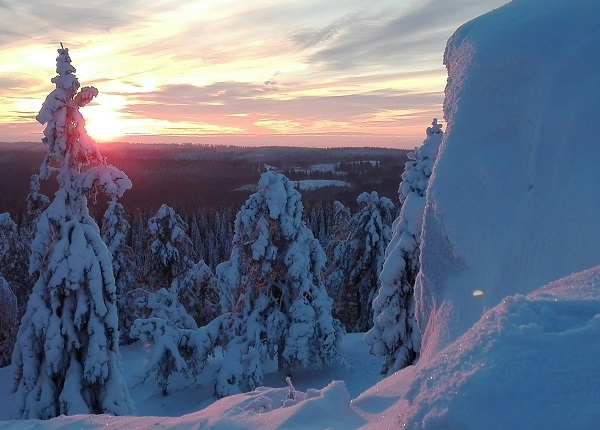 Guided snowshoe tour to the highest scenic viewpoints in Koli National Park. The tour starts with a short introduction to snowshoeing technique – no previous experience is needed! On the tour you explore the wintry forest, see beautiful scenery, snow-covered trees, and small ice falls. Your guide tells you about Koli, its nature, history and culture. You also have time to enjoy the nature, take photos and have fun with your snowshoes. Price includes hot juice. Difficulty Suitable for people with normal health. The trail has some up- and downhills, but the pace is relaxed. Additional information Trail snacks for the tour are available on request at an additional cost. Koli Shop Retkitupa is a small souvenir and outdoor equipment shop located in Koli Nature Centre Ukko. Deep snow and peaceful nature in Koli on forest skis! Try skiing on the forest skis in deep snow, on snow-covered forests, fields or frozen lake! The tour begins with a short introduction to forest skis and skiing technique – no previous experience skiing on forest skis is needs. The destination of the tour is chosen according to snow and weather conditions. The skiing distance and pace is adapted to each group. We stop for a hot juice and snack break during the tour (included in the price). The tour is organised snow and weather conditions permitting. Skiing distance tailored to each group. Difficulty Suitable for over 15-year old persons with normal health. Skiing pace is relaxed. Additional information The tour price includes forest ski rental and snack (hot juice, savoury muffin, cookie). Bouquet of Songs is a unique tour at Koli, surrounded by the most beautiful Finnish national landscape and the sounds of nature, you listen to Finnish folk songs and ballads sung by a trained singer. The unforgettable event can be organised in sunset or sunrise, in bright sunlight or in mysterious moonlight. It can be given as an anniversary present or thank you, or it can be a surprise during a walking tour in Koli. This easily accessible tour celebrates the spectacular landscape of Koli which has inspired so many Finnish artists. The singer meets the group in Koli Shop Retkitupa, located at the corner of Break Sokos Hotel Koli, from where you walk together to the location where the songs are performed. The singer can also meet the group at a specified location near Ukko-Koli, Akka-Koli or Paha-Koli in the Koli National Park. The singer tells you shortly about Koli and each song before the performance. Afterwards the group can return to Koli Shop Retkitupa with the singer or continue their walk independently. Welcome to enjoy the spectacular national landscape of Koli with us! Duration Singing performance approx. 15–20 min, walk to the location approx. 20 min. Price €100/group, includes VAT 24%. If there are more than 30 people in the group, the group can be divided in two and both groups have their individual singing performance at specified times in the same location. Extra charge is €40 for the second group. Additional services A guided 1–1.5 hour Best of Koli on Snowshoe -tour. Inquire about prices and availability. We also offer guaranteed departures for individuals, small groups and families. 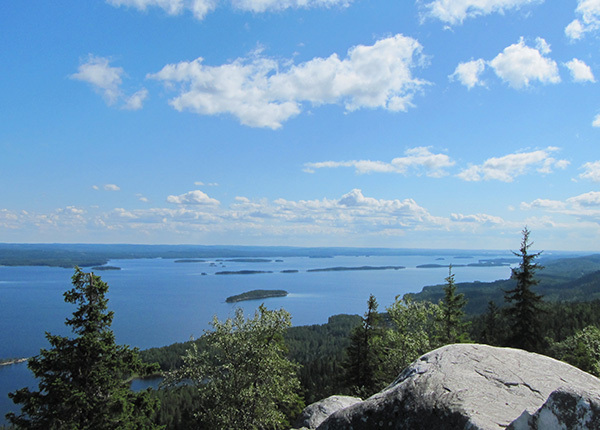 This scenic trail includes Koli’s most famous panoramic views. The tour starts from Koli Shop Retkitupa, located at the Nature Center Ukko, where you meet your guide. The tour takes you to the highest scenic points in the Koli National Park: UkkoKoli, Akka-Koli and Paha-Koli. During the tour, your guide tells you interesting facts and stories about Koli, its history, nature and culture, as well as artists who have found inspiration in the Koli hills. You see spectacular views throughout the tour, and you have plenty of time to enjoy them and take photos. Welcome to enjoy the Koli national landscape with us! Price €11/person when there are 35 or more people in the group. €13/person when there 20–34 people in the group. €15/person when there 5–19 people in the group. If the group is smaller than 6 people, the tour price is based on a group size of 5 people. Included in the price An accompanying guide throughout the tour. Two accompanying guides for groups with more than 25 people. VAT 10% is included in the price. Equipment Participants should have suitable outdoor clothing, comfortable walking shoes and in warm weather a bottle of water. Additional information Koli Shop Retkitupa is a small souvenir and outdoor equipment shop. We have a wide range of Finnish products such as wooden Kuksa-cups, traditional knives, postcards, local canned fish, headwear and Koli books and T-shirts. Invoicing According to an agreement. Cancellation policy If cancellation is made 14 to 4 days before the booked tour, 50% of the agreed tour price will be charged. If the booking is cancelled less than 4 days in advance, 100% of the price will be charged. The invoicing will be done according to the confirmed number of participant 4 days prior to the tour or if more people participate, according to the actual number of people on the tour. The hike starts from Koli Shop Retkitupa where you meet your guide. First, you walk to the most well-known scenic points in the Koli National Park: Ukko-Koli, Akka-Koli and Paha-Koli. From there, walking at an easy pace, you hike to the nearby Mäkrä Hill from where a spectacular view over the Lake Pielinen opens in front of you. The way back is via different trails, offering a chance to see meadows and different forest types. 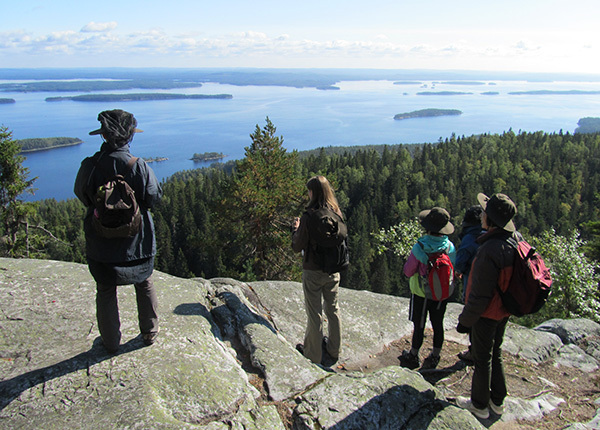 During the hike, your guide tells you about the history, nature, geology and culture of Koli. You also have plenty of time to take photo. Refreshments are not included in the tour, but you can bring your own snacks and enjoy them at a fire place. You are warmly welcome to enjoy the unforgettable landscape of Koli with us! Difficulty Best suited for people who are fairly fit. There are up- and downhills on the route, but the walking pace is relaxed. Price €33 €/person when there are 26–50 people in the group. €35 €/person when there are 16–25 people in the group. €37 €/person when there are 6–15 people in the group. If the group is smaller than 6 people, the tour price is based on a group size of 6 people. Equipment Participants should have suitable outdoor clothing, comfortable walking shoes and a bottle of water with them. Additional information Trail snacks for the hike are available on request at an additional cost. Additional information Koli Shop Retkitupa is a small souvenir and outdoor equipment shop. We have a wide range of Finnish products such as wooden Kuksa-cups, traditional knives, postcards, local canned fish, headwear and Koli books and T-shirts. Bouquet of Songs is a unique tour at Koli, surrounded by the most beautiful Finnish national landscape and the sounds of nature, you listen to Finnish folk songs and ballads sung by a trained singer. The unforgettable event can be organised in sunset or sunrise, in bright sunlight or in mysterious moonlight. It can be given as an anniversary present or thank you, or it can be a surprise during a walking tour in Koli. This easily accessible tour celebrates the spectacular landscape of Koli which has inspired so many Finnish artists. 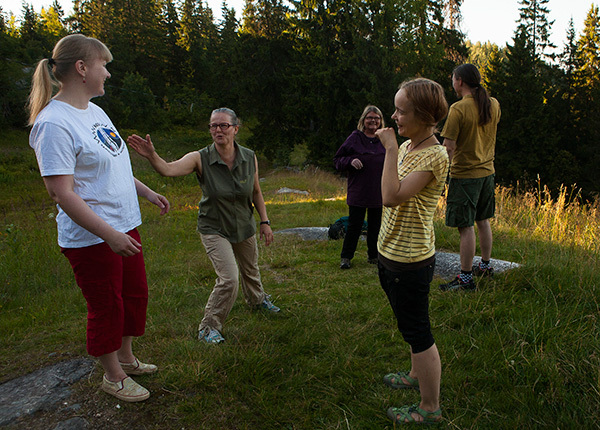 The singer meets the group in Koli Shop Retkitupa, located at the Nature Center Ukko, from where you walk together to the location where the songs are performed. The singer can also meet the group at a specified location near Ukko-Koli, Akka-Koli or Paha-Koli in the Koli National Park. The singer tells you shortly about Koli and each song before the performance. Afterwards the group can return to Koli Shop Retkitupa with the singer or continue their walk independently. Welcome to enjoy the spectacular national landscape of Koli with us! Price €100/group, includes VAT 24%. If there are more than 30 people in the group, the group can be divided in two and both groups have their individual singing performance at specified times in the same location. Extra charge is €40 for the second group. Additional services A guided 1–1.5 hour Koli Scenic Walking Tour €14 €/person (Minimum price is based on a group size of 5 people). 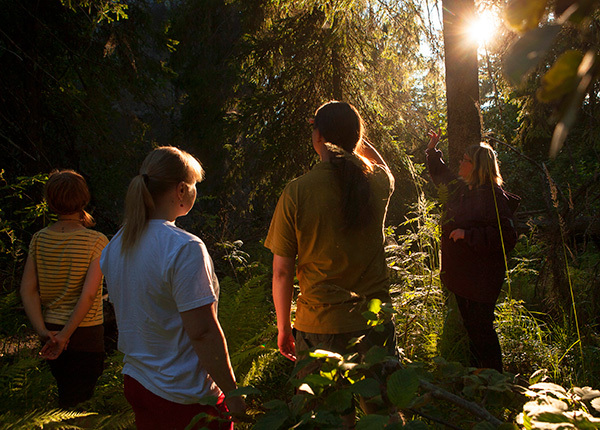 The unique accompanied walking tour starts from the Koli Shop Retkitupa at the Nature Center Ukko. Along the tour, which is designed to give you a personal and profound experience in the nature, you have the opportunity (alone or in small groups) to participate in sensory enhancing activities that will deepen your personal connection with nature. Through seeing, hearing, touching and even tasting your natural sensibilities and creativity are awakened. Inspired by nature, your inner strength and sense of well-being are renewed. The tour mostly follows trails in the Koli National Park but during some exercises we leave the tracks. The tour also takes you to the beautiful scenic points within the Koli National Park. The exercises and activities you learn during the tour can be done on your own in a natural environment such as your local park, woodland or any place of natural beauty. Difficulty Suitable for anyone in normal health. Some hills but the pace is relaxed. Price includes An accompanying guide throughout the tour (for a group of more than 20 people 2 guides), VAT 10%. Equipment Participants should bring their own waterproof outdoor clothing and comfortable walking shoes. Water bottle in warm weather. Additional information Koli Shop Retkitupa is a small souvenir and outdoor equipment shop. We have a wide range of Finnish products such as wooden Kuksa-cups, traditional knives, postcards, local canned fish, headwear and Koli books and T-shirts. This tour gives you an opportunity to experience relaxing therapeutic laughter in the beautiful natural surroundings of Koli. During the tour, you do guided breathing and laughing exercises which clear your lungs and activate the muscles needed in laughing. Regular laughter exercises have benefits for both physical and mental well-being. In this tour, the pure, clean nature and air reinforce the benefits of laughter. The tour starts with gentle warm-up exercises such as stretching and ends with free laughter and relaxation. During the tour, you walk a couple of hundred metres on easy, even paths in the Koli National Park. No prior experience in laughter therapy or laughter yoga is needed. Come with an open mind, loose-fitting outdoor clothing suitable for the weather, comfortable walking shoes and in warm weather a bottle of water. Welcome to laugh with us! Walking distance A couple of hundred metres on easy trails. Included in the price Accompanying trained laughter yoga instructor. VAT 10% is included in the price.